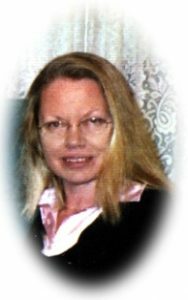 Linda A. Salli-Kolocek, age 63, of Port Washington, WI passed away peacefully at home on Saturday, December 23, 2017 with her loving family by her side. She was born in Ironwood, Michigan on July 11, 1954; daughter of Tarmo “Tom” and Betty Tapanila Salli. Linda grew up in Hurley and Newburg, WI graduating from Ozaukee High School, later receiving an Bachelor of Fine Arts from the University of Wisconsin-Stevens Point. Shortly after graduating she moved to Minneapolis, where she continued her education at the University of MN, calling Minnesota home for the next 20 years. On July 8, 2004, Linda married James T. Kolocek of Port Washington. Back in Wisconsin she was close to her parents and siblings, additionally gaining another family in the Koloceks. Those who knew Linda saw her as a soft-spoken, loving and giving woman. She enjoyed the beauty of nature, most lovingly shared through her watercolor paintings and in her concern that neglected animals were given a safe and loving home. Her quietness showed an underlying strength and compassion, evident when she selflessly found time to care for someone in need. Her gentle spirit will be missed by all. Linda is survived by her husband Jim, her mother Betty Salli of Saukville, her siblings Terry (Sheila) Salli of San Antonio, TX, Suzie (Walt) Rabus of Port Washington, Brenda (Harry) Bernstein of Kaukana, Karen Salli of Saukville, Julie (Joe) Post of Indian Trail, NC and Annette (John) Foat of Fredonia, many nieces and nephews, members of the Kolocek family, and numerous other relatives. She is preceded in death by her father Tom, and her father and mother-in-law, Dr. Raymond and Hazel Kolocek. No formal services at this time. A gathering in her memory will be held in the summer of 2018. As an expression of sympathy, memorials may be sent to James Kolocek to aide in expenses incurred throughout Linda’s illness. Previous Post: Parlow, Shirley M.
Next Post: Bantleon, Mark S.